Ed Lantz is an entertainment technology engineer, entrepreneur, immersive experience designer and innovator in giant-screen digital cinema. He left aerospace engineering in 1990 to transform old-style planetariums into 360-degree immersive visualization environments, designing over a dozen dome theaters worldwide while at Spitz, Inc. including the Library of Alexandria in Egypt, National Space Center in Leicester, UK, the Glasgow Science Center in Glasgow, Scotland and Papalote Museo del Nino in Mexico City. He also led the product development of the SciDome digital planetarium which has sold over 100 units worldwide. Ed co-founded Vortex Immersion Media in 2007 to bring immersive and interactive experiences into mainstream entertainment markets. Vortex produces immersive media experiences for themed entertainment, digital planetariums, and numerous Fortune 500 companies including Condé Nast, EMC2, Microsoft, NBC Universal, Nestle, NFL, Nike, Nokia, Sprint and Turner Broadcast. Vortex also operates the Vortex Dome, the first commercial immersive media production studio and events venue located in downtown Los Angeles. 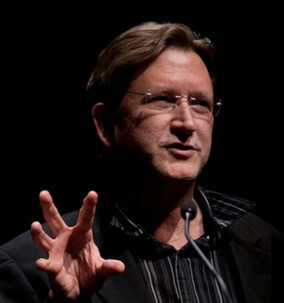 Ed has published numerous articles in journals and trade publications on immersive media and virtual reality, is a public speaker on various panels and keynote talks including at the Academy of Motion Picture Arts and Sciences and Digital Hollywood and has organized a panel and three courses at ACM/SIGGRAPH in addition to guest-editing an issue of Computer Graphics. Ed's research focus is on the unique cognitive properties of next-generation multisensory “sentient” environments, the merging of virtual and real storytelling worlds, and the development of fulldome theaters as next-generation entertainment and performance venues. Ed holds two U.S. patents on immersive theater technologies, was awarded a Master's degree in Electrical Engineering with minor in Quantum Physics and Electromagnetics from Tennessee Tech University, and is a founder of the trade association IMERSA. He co-authored DIGSS 1.1 (Digital Immersive Giant Screen Specifications) in cooperation with the Giant Screen Cinema Association, is a member of ACM/SIGGRAPH and IEEE, and chairs the Board of nonprofit organizations c3: Center for Conscious Creativity and Create Now.